Rajinikanth's ENTHIRAN 2 and Prabhas' BAAHUBALI 2 go on floor on the same day! No doubt Rajinkanth’s ENTHIRAN and Prabhas' BAAHUBALI have taken South Indian Cinema to dizzy height of popularity, particularly in Bollywood and in International cinema. Both the films wrote new box office history in Bollywood and foreign market that was never been seen before. In fact the sequels of the both the movies are now most anticipated not just by South India film fans but by fans of Bollwood as well as foreign countries. The good news is that both the sequels, incidentally, kick-started on December 16, 2015. Though Rajinikanth was busy shooting for KABALI in Goa but he flew down to Chennai for the commencement of ENTHIRAN 2. Film wizard Shanker informed his fans on twitter- ENTHIRAN 2.0 shoot starts … Excited!!! According to sources close to the film Shanker conducted the first day shoot with pomp and spectacle in Chennai. From tomorrow i.e. December 17 he wiil start shooting the first portion of the film with scenes that do not require Rajinikanth. The shooting is being held at an enormous set erected in the EVP Theme Park, situated on the outskirts of Chennai-Bangalore National Highway. Initially a ten days shooting schedule will be picturised here and later it will move to Bolivia. 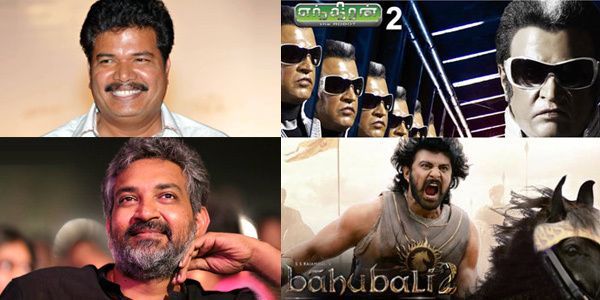 While Shaker began shooting of ENTHIRAN 2 in Chennai, S.S. Rajamouli too began shooting of his second installment of BAAHUBALI 2 in Hyderabad on the same day. What readers may not know is that December 16 is a very important date, no not due to any religious significance but it has a great place of pride in Indian history. Any Guess? Well it was on December 16, 1971 India registered its victory over Pakistan in the Indo-Pakistani war of 1971. The day is thus celebrated as 'Vijay Diwas'! One hopes both ENTHIRAN 2 and BAAHUBALI 2 achieve Vijay i.e. success at the box office across the globe more than their originals. 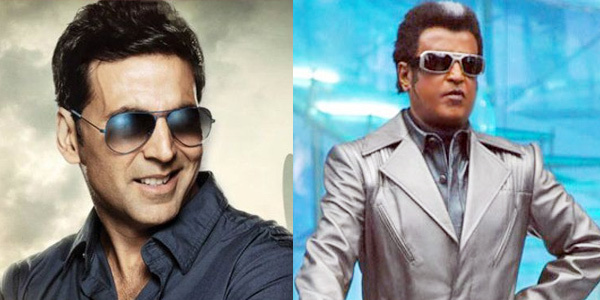 Is ‘Seedhe Sadhe’ Akshay Kumar the right choice to play ‘villain’ in ENTHIRAN 2? Remember the hit song Hum Hain Seedhe Sadhe Akshay….from the film KHILADIYON KA KHILADI in which Akshay Kumar sung this song on screen. It suited his image because frankly speaking Akshay Kumar is truly seedha sada i.e. simple and down to earth personality. Amazing despite Akshay Kumar’s humble and gentle personality brilliant filmmaker Shanker has cast him as the main villain opposite the mighty Rajinikanth in his upcoming sequel ENTHIRAN 2 leaving behind better options like Hollywood icon Arnold Schwarzenegger or the Bollywood Mr. Perfectionist Aamir Khan or Bollywood hunk Hrithik Roshan! Though Akshay Kumar has played villain roles in many films in the past like KHILADI 420, ONCE UPON AY TIME IN MUMBAI DOBAARA! Or SPECIAL 26 etc but most of the time he has been a failure except in Abbas Mastan’s hit film AJNABEE (2001). In this film he played an astute killer and took the viewers by surprise. The movie also fetched him many awards as Best Villain including the prestigious Filmfare. However in the past over one decade Akshay Kumar’s image has undergone a drastic transformation. Today more than his action image Akshay is more famous for his comedy roles. His hits films HERA PHERI, HEYY BABYY, HOUSEFULL, WELCOME etc. just prove that that it is comedy that saved Akshay’s career from drowning or else he would have been passé. Thus if the audience recognizes Akshay for his comedy than will they accept him as a ruthless villain and that too opposite the dynamic actor Rajinikanth? Further it must be recalled that filmmaker Shanker had earlier categorically informed that the villain’s character in ENTHIRAN 2 is equally powerful as that of Rajinikanth. Hence Shanker was ambitious to rope in a talented actor at par with Rajinikanth but alas despite approaching Aamir Khan, Amitabh Bachchan, Hrithik Roshan and even Hollywood superstar Arnold Schwarzenegger none could materialize. But that doesn’t mean Shanker should have settled for anything less. If top stars were not available he must have launched an all India Talent Hunt and discovered a sensation newcomer just as Ramesh Sippy did and discovered Amjad Khan for SHOLAY, who proved so powerful that he overpowered all the top stars like Amitabh Bachchan, Dharmendra, Sanjeev Kumar, Hema Malini and Jaya Bhadhuri in the film. Similarly remember legendary filmmaker director K Balachander had discovered Rajinikanth in his film APOORVA RAAGANGAL (1975) in the negative role of an abusive husband opposite Srividya. If had settled for an ordinary villain and not discovered Rajinikanth than the world would have never witnessed an iconic actor like him. What say readers should Shanker replace Akshay Kumar with a better option? Give your opinion may be he might change his decision!! !